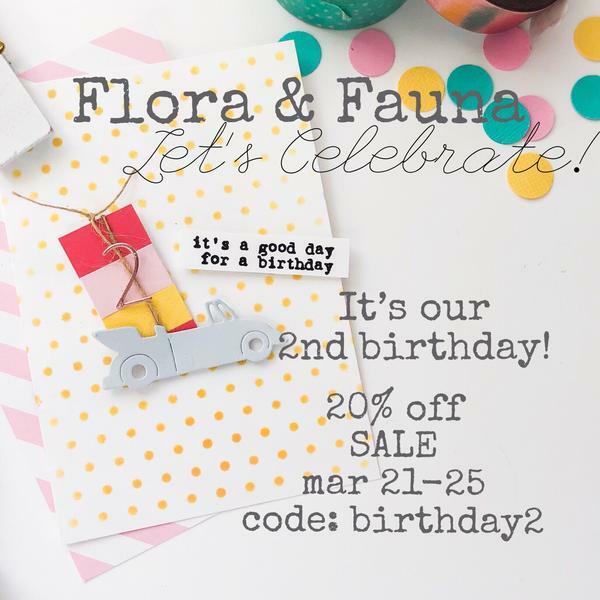 Hope you all will join me in wishing Flora & Fauna a very happy birthday! They’re TWO! And lucky you, they’re having a 20% off sale that ends today! Just use code birthday2 at checkout. Of course I had to make a card to celebrate, right!? So I put together this quick little number! I think this new squirrel die totally steals the show! Who’s with me? Best of all? It’s only $3! Talk about a STEAL! 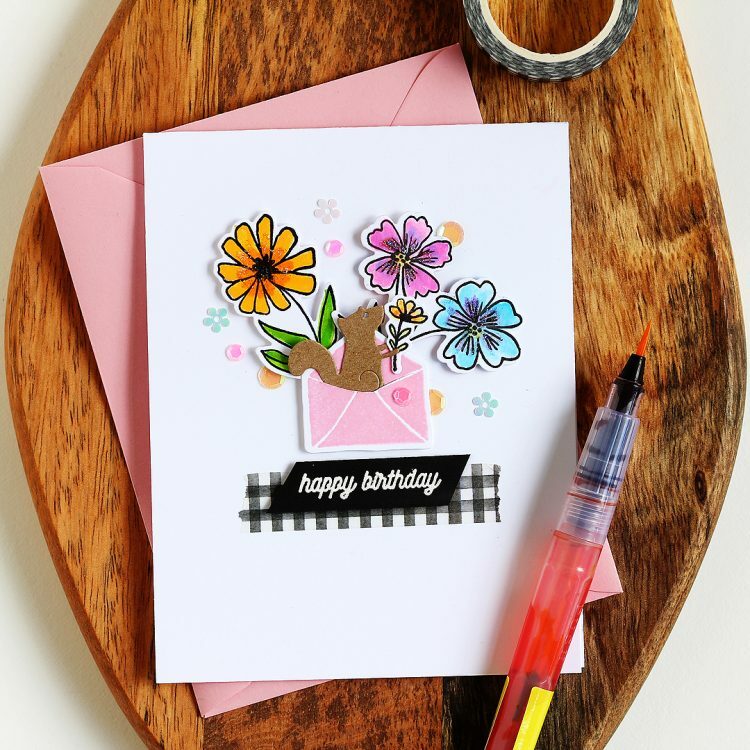 The flowers and that cute lil envelope are from the new Flower Garden set. I just used an xacto knife to cute a little slit in the envelope for the squirrel to pop out of, then had him hold a tiny flower. Ahhhh can you tell I was giggling the whole time I was making it? In case you were wondering, I colored the flowers with the new Tropical Fiesta watercolor brush markers from Altenew — this colors just make me happy! Then to finish off the card I just added a few sequins , some gingham washi, and the birthday sentiment from the Woodland Birthday set. I plan to send this card to J’s Grandma — she’ll be turning 92 on April 4th! 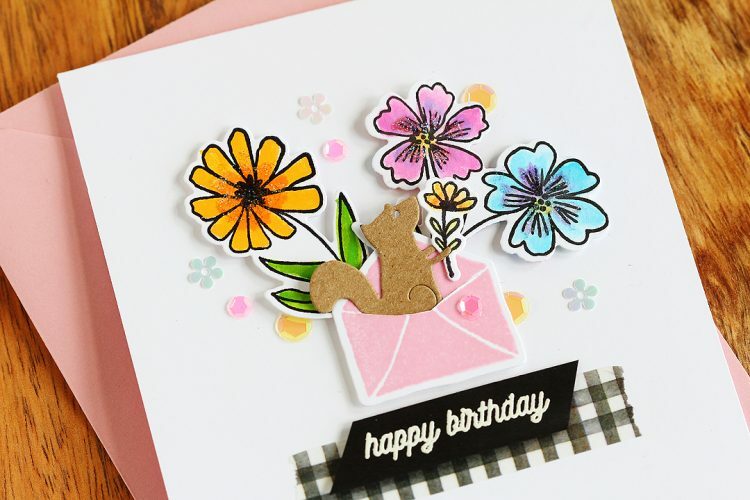 Find all of these adorable Flora & Fauna stamps and dies HERE in there shop — don’t forget to use birthday2 at checkout to save 20%!